The Phoenix Audio Condor Expansion Video Conference System is a custom-built system, specifically designed to provide multiple beamforming mic arrays while remaining a clutter-free solution. This kit is perfect for large collaboration spaces of all shapes and sizes. 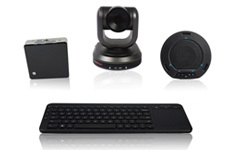 A DSP with no programming required, paired with two microphone arrays, allows you the flexibility to place them anywhere in the room to capture high-quality audio.The parts that we've chosen are highly compatible with most, if not all, video conference software, so you can choose from your favorites such as GotoMeeting, Blue Jeans, Adobe Connect, and many more. All components in the system are considered easy-install items and could be set up by someone without prior experience, simply by following the included product instructions. If a professional is preferred, the install is well within the capabilities of a local handyman or contractor, which should be easy to locate in your local area. PTZOptics 12X-USB Gen 2 - PT12X-USB-GY-G2 - The PTZOptics 12X-USB is a second generation USB 3.0 conference camera with multiple video outputs. It features USB 3.0, HDMI, CVBS, & IP Streaming. It also has the ability to embed line-level audio over the USB 3.0 & IP Streaming. 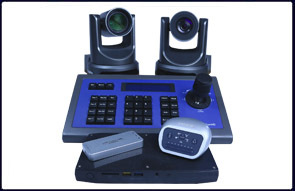 The camera has multiple ways of control, such as the included IR remote, Sony VISCA protocol, Pelco-D & P, UVC, and IP control. Be seen clearly through one or all 3 of the simultaneous USB 3.0, HDMI, and/or IP Streaming in Full HD 1080p @ 60 FPS. Intel NUC with i5 Processor - i5-7260U - The Intel i5 NUC is a custom designed mini PC that has all the perks you'll need when video conferencing. It includes: 256GB Solid State Drive, 16GB (2 x 8GB) DDR4-2133 SODIMM RAM, & a 7th generation Dual-Core 2.2GHz processor. It has 4) USB 3.0 ports; one of them being a charging port. It comes standard with Windows 10 Pro. A revolution in ultra-compact device design, Intel® NUC packages a fully scalable, computing solution in the smallest possible form factor, complete with the Intel Core i5 processor. This new generation computing device provides a flexible, customizable engine to drive digital signage, kiosks, and intelligent computing for small spaces, or anywhere else you can imagine. Intel NUC also has triple display 1 capabilities for multiple monitoring and display. With that kind of power and size, you’ll rethink what’s possible. Because the only thing more amazing than Intel technology is what you’ll do with it. Phoenix Audio Stingray Smart DSP Mixer - MT700 - This kit includes proper speakers and mics to pair with the Phoenix Audio Stingray, an all in one smart mixer utilizing Phoenix Audio's own distribution array technology. Each Stingray allows for up to 4 microphone inputs, performs echo cancellation, noise cancellation, AGC, and other algorithms required for conference room setups. You have the ability to daisy chain up to 15 Stingrays giving you a maximum of 60 microphone inputs. The Stingray outputs its signal via USB 2.0, SIP, and analog phoenix connector. Phoenix Audio Condor - MT600 - The Condor is a beamforming microphone array with a built-in DSP. Designed to provide a clutter-free solution with multiple interfaces for audio pick-up, this microphone array is perfect for huddle-rooms and open spaces. The Condor is compatible with any speaker or sound bar. Dual Connectivity - Offering multiple interfaces in a single product. This feature allows the use of one product in a room that requires multiple connectivity options (audio and video conferencing). Bridging - The ability to connect two calls from different interfaces simultaneously, making your video conferencing participants able to speak with your audio conferencing participants as well as yourself through your device. Direction Finding - The ability to recognize the direction of the person speaking in the room. Beamforming - The ability to steer the directionality of the device’s microphones. Beamforming improves noise and echo cancelling as well as the overall quality of the device’s pickup. This feature works in conjunction with direction finding. Power Over Ethernet (POE) - The ability to provide power to the device through the ethernet connection getting rid of the need to use a separate power supply. USB Power - The ability to provide power to the device through the USB connection getting rid of the need to use a separate power supply. Wall Mountable - This product supports a mounting system that allows you to hang it on surfaces such as walls and ceilings. LED Indications - LEDs indicate the voice pickup and direction as well as muting.